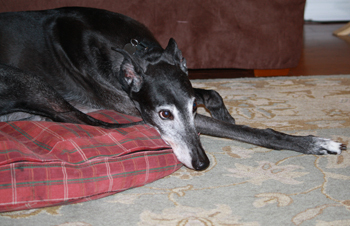 Nico, aka RX Nicoderm, is a shiny black 9-year-old male, born April 14, 2002. Nico's sire is Oshkosh Slammer and his dam is Kadeestattletale. Nico's racing career spans only 36 races, starting March 4, 2004 at Gulf Greyhound Park at La Marque, Texas, and ending at Valley Race Park on December 1, 2004, when he won first place for the fifth time. Nico suffered a cracked hock shortly thereafter, which Dr. Ron Streid reparied successfully. 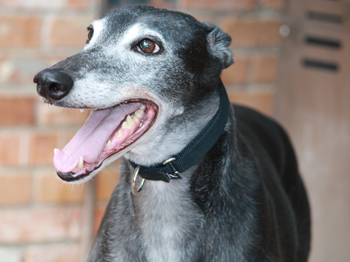 Nico was in a home for many years, but has since been returned to GALT due to a change in circumstances for his family. 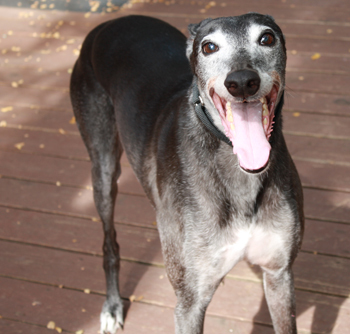 Nico is a well-adjusted, friendly greyhound with wonderful manners who has lived peacefully with cats for years. He is looking forward to finding his next home!